← We’ve Just Been Published Again!! 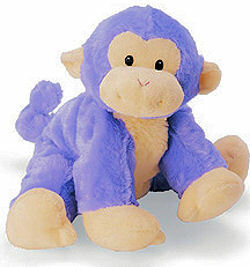 I’m not quite sure how your site works, but I am trying to find out where I can find, or who makes the stuffed toy purple monkey seen on this past week’s episode of One Tree Hill! Thanks so much in advance for ANY & ALL help!! I don’t watch this show so I don’t know where to begin to help her. If you can help Melissa find this monkey, THIS SITE IS NO LONGER ACTIVELY MANAGED. Please use Our FREE FACEBOOK GROUP, including #042708-1 in the subject, . I sent an eBay listing to Michael that would ship Worldwide, but I checked and the Plush Friends site does have directions for International shipping, so I wrote him again. but i am not sure if it is purple and it is a rattle. Also it is smaller :(. Please help.